A review of medical literature finds acupuncture to be effective in treating some dermatologic conditions when compared to alternative treatments, placebo acupuncture, or no treatment. Specifically, the evidence indicates this form of Traditional Chinese Medicine showed the greatest benefit in cases of dermatitis, pruritus, urticaria, hyperhidrosis, and facial elasticity. “The use of acupuncture is broad and our findings show that acupuncture is growing within dermatology and in need of continued efforts for high-quality research,” Dr. Raja Sivamani, an assistant professor in the department of dermatology at UC Davis, told Medical Daily. For centuries, the Chinese have used acupuncture, which involves stimulation of points along the skin using needles, pressure, or heat, to treat a range of medical conditions. As described by Sivamani and his colleagues, the theory underlying acupuncture is this: Disease is caused by disruptions in the body's vital energy (qi), which flows along channels (called meridians) that form a network connecting the body's organs. Generally, each acupuncture point is located along these meridians, and stimulation restores normal circulation of qi to achieve balance and cure disease, practitioners say. Currently, only a small number of American adults visit acupuncturists — about 1.4 percent of adults make the trek each year, experts estimate. Still, complementary medicine and alternative practices appear to be growing in popularity. If you decide to visit an acupuncturist, ask your friends for a good referral and check credentials. Most states require a license, certification, or registration to practice acupuncture, according to the National Center for Complementary and Integrative Health, which notes relatively few complications have been reported. Anticipating an increasing number of patients seeking acupuncture, Sivamani and his co-researchers decided to evaluate its effects on skin conditions. They began with a search of scientific databases for clinical trials, case reports, and comparative and other studies that focused on using acupuncture to treat dermatologic conditions. Though the initial yield was 1,255 articles, the science team narrowed the field down to 24 studies conducted in centers around the world, including those located in China, Germany, Korea, Taiwan, the United States, and Sweden. Acupuncture resulted in “statistically significant improvement of outcome measurements” in 17 of 24 studies, Sivamani and his colleagues report. Conditions treated and highlighted in each of these studies included acne, atopic dermatitis, urticaria, pruritus, chloasma, neurodermatitis, dermatitis herpetiformis, polyhidrosis, HPV warts, breast inflammation, and facial elasticity. 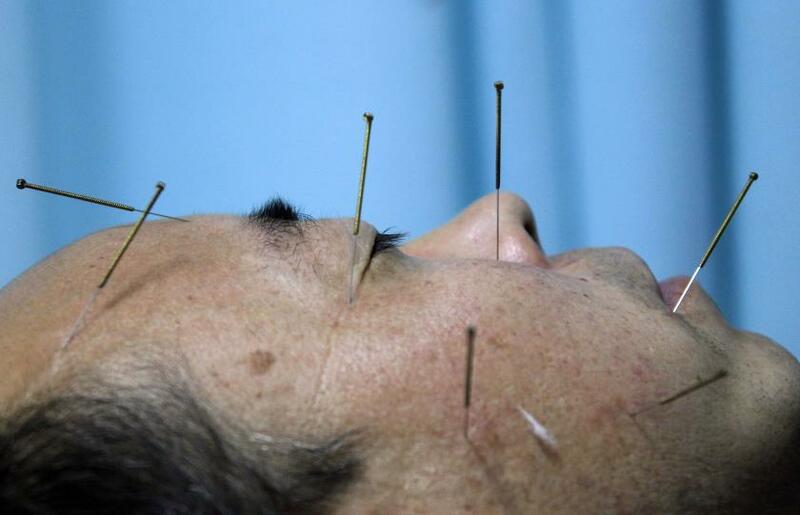 When did acupuncture help patients... and when did it not? By the strictest scientific standards, acupuncture cannot be said to work on acne or chloasma, a darkening of the skin (commonly occurring during pregnancy). Three separate studies examined the therapeutic effects of acupuncture in clearing acne lesions. While one found no statistically significant difference between acupuncture and either herbal medicine or no treatment, two of the studies — observational experiments that lacked a control group for comparison — reported clearance of acne lesions in most participants. Results also appeared mixed, the researchers find, when acupuncture was used to treat chloasma. There's plenty of good news, though. Many researchers had examined acupuncture as a treatment for dermatitis, urticaria, and pruritus, with a total of 14 studies involving 559 participants. Studies of atopic dermatitis, a type of eczema that causes dry, itchy skin, had a small number of participants, still their results were both positive and statistically significant for the groups treated with acupuncture compared to groups treated with either placebo acupuncture or no intervention. Three studies addressed urticaria or hives. Compared with placebo acupuncture, acupuncture reduced the rate and duration of urticarial episodes and compared with oral antihistamines, acupuncture resulted in greater clearance of wheals; results from both studies are considered statistically significant. One observational study without a comparison group showed complete clearance of wheals and prolongation of time between relapses for about a quarter of the patients treated with acupuncture. Acupuncture relieved pruritus, or itchy skin, in three studies and one case report. In particular, one study found acupuncture to be superior to herbal medicine and oral diphenhydramine plus vitamin C for clearance of rash from neurodermatitis. Finally, four studies found acupuncture to be effective in treating breast inflammation, polyhidrosis (excessive sweating), HPV wart, and facial elasticity. Going forward there’s more work to be done in examining the value of acupuncture’s effects, Sivamani believes. “We are planning to collaborate with specialists in acupuncture to conduct studies that would evaluate their effect in chronic inflammatory skin conditions, such as acne,” he told Medical Daily. Source: Ma C, Sivamani RK. Acupuncture as a Treatment Modality in Dermatology: A Systematic Review. The Journal of Alternative and Complementary Medicine. 2015.